Get Well Soon Elmo Doll - 12"
Your favorite Sesame Street Character is her to make you feel better! 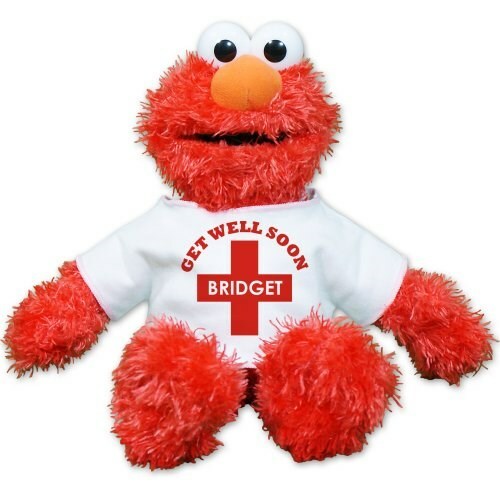 Send a heartfelt get well wish to your loved one with this Plush Elmo Doll. Elmo is wearing a t-shirt with our Get Well Soon design. This design may be personalized with any name, for free. Elmo is filled with beans at the bottom to make the perfect sitting pal on your desk or shelf. Along with the super soft, silky fur, Elmo measures approx. 12” of perfect, cuddly goodness. Surface Washable. Free gift wrapping and a free gift message are included for a thoughtful presentation. Additional Details Find great get well plush animals from 800Bear!